I bake a lot, so my most well-used cookbooks are baking books. I know a cookbook has become an all-time favorite when I start to reach for it over and over again. That’s the case with Flour. It all started with homemade Oreos. I made a version that was adapted from the book, and they were fantastic. I was intrigued, and as soon as I looked through it (via the library), I knew I needed to have it on my bookshelf. There are a range of sweets in the book, but there are also savory recipes too – quick breads, yeasted breads, quiche, pizza. I haven’t delved into any of the savory recipes yet – I seem to be focusing mostly on the cookie section first. I love that the recipes include weights for ingredients. Not only that, but metric! Weighing ingredients = better results, and fewer dishes to wash! The other thing about the book – the recipes are really well-written and well-tested (not always the case with books that come from restaurant chefs, but her collaborator is Christie Matheson – always a good sign). It makes me want to fly to Boston and eat everything on Flour’s menu. And Joanne Chang is terrific – very engaged and responsive via Twitter. Joanne has a second book in the works, and I can’t wait to get it. Sugar & Spice Brioche Buns: Pictured above, I’m pretty sure fresh yeast is part of what makes the brioche from this book so good. These buns are topped with melted butter and sprinkled with a spice mixture, and they’re wonderful straight out of the oven. Go now to the lovely Dessert First blog and get the recipe. Homemade Oreos: They really are better than the store-bought version. I’ve only made the adapted version, but will eventually go back and make the recipe straight out of the book. Homemade Pop Tarts: Again, better than what I used to scarf down in college (I wasn’t allowed to have any sweet stuff for breakfast as a kid). Easy to make, and incredibly delicious any time of day. Ginger Molasses Cookies: Out of the gazillion recipes I’ve tried in my quest to make the perfect ginger molasses cookie, this one came the closest. Chocolate Cupcakes with Crispy Magic Frosting: How gorgeous is this buttercream? It forms a sugary crust as it sits and it works great with the chocolate cake. Snickerdoodles: Good, but probably my least favorite thing out of the book. And I think it’s because neither Larry or I particularly like snickerdoodles. Oatmeal Raisin Cookies: By far Larry’s all-time favorite type of cookie, and he loved this version. Brown Butter-Crispy Rice Treats: See the trend here? I’m drawn to the updated, much better versions of my childhood favorites. Despite my rice allergy, I couldn’t resist these. They are the best Rice Krispy Treat you will ever put in your mouth. Cornmeal-Lime Cookies: This book excels in the cookie area. This cookie is different – with a lime glaze and crunch from cornmeal, it will make everyone love you. Double Chocolate Cookies: The king of all chocolate cookies. They’re a favorite when I give them out to friends. Sticky Sticky Buns: I served these for brunch six months ago and my neighbors are still talking about them. The brioche for these is absolutely gorgeous, and a dream to work with. These buns made my Best of 2011 list. Flour’s Famous Banana Bread: I’m probably starting to sound like a broken record, but this is the best banana bread I’ve ever made. Super-Pumpkiny Pumpkin Pie: It’s probably the best pumpkin pie in the world, but with my record of ruining pumpkin pies, it’s no surprise that mine didn’t turn out great. Lemon Lust Bars: Lemon bars, eh. This is a good recipe, but I’m not a super big lemon bar fan. But the lemon curd from this recipe is fantastic and has become my standard curd recipe. And I make a LOT of lemon curd. Nutmeg-Spice Cake with Creamy Rum Buttercream: Larry thought this cake was too boozy, but I thought it was good. Warm spices, and a creamy, rummy buttercream. What’s not to like? Chunky Lola Cookies: Pecans, oats and chocolate chunks. Another winner in the cookie section. Addictive Bran Muffins with Golden Raisins and â€œBird Seedâ€: Joanne says this is her favorite recipe in the book, and I can see why. Oat bran soaked in creme fraiche and milk? No wonder they’re so good. And I love the seed mixture on top. French Lemon-Poppy Pound Cake: Such a lovely little pound cake. Simple and moist. Deep, Dark, Spicy Gingerbread with Coffee Glaze: The only thing that puts me off is the coffee glaze, but I’m betting the gingerbread is great. Milky Way Tart: Genius. I’m a big fan of candy bars turned into pies, tarts, cakes. Toasted Coconut Cream Pie with Lime Whipped Cream: That Larry, he doesn’t like the texture of coconut. But I think coconut cream pie is my most favorite pie ever, so I’m going to make this at some point. He can watch me eat it. Mom’s Granola: Nothing fancy, just granola. Except I’m a granola junkie so I have to make this. Lemon-Raspberry Cake with Lemon Buttercream: This cake intimidates me. But boy, is it beautiful. Honey-Cinnamon Ice Cream: With my honey obsession and my constant ice cream making, you’d think I would have made this by now. It’s on my to-do list for sure. 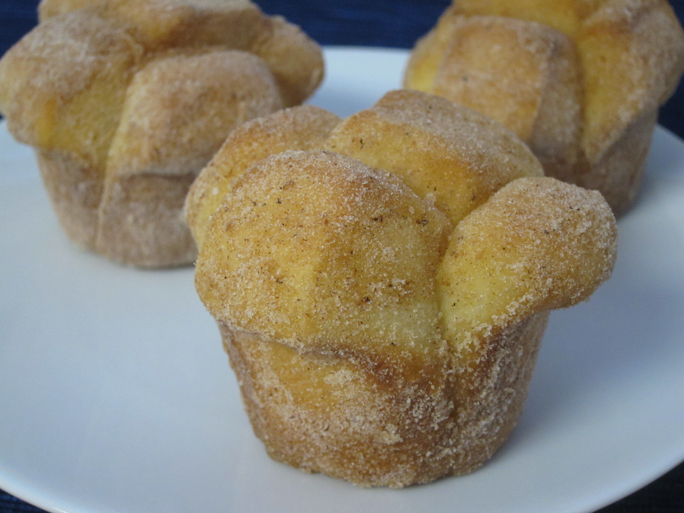 Brown Sugar Popovers: I love popovers. Larry doesn’t. If I thought I could resist eating an entire batch, I’d probably make these today. The brown sugar intrigues me. I have this cookbook on my shelf based on your recommendation. I haven’t really made anything from it yet! I guess I need to fix that ASAP. Definitely. I think my favorite so far is the sticky buns. But the oreos and the bran muffins are a close second.